Have your Magento e-commerce platform data populated in your Kustomer platform in real-time using the Magento + Kustomer integration. This integration will sync standard objects out of the box such as new customers, orders, etc. You can also send your own custom events to Kustomer and have them populated as custom objects. Manage all customer interactions in one place driving efficiencies within your support team. 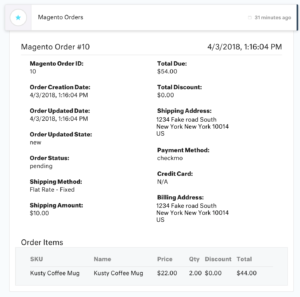 View the Magento objects in your customer’s timelines to get a complete picture of customer data.